A wet day at Valhalla, but one hardly touched by the expected severe weather. Wet conditions did have a significant impact on how the course played. Driving distance was slashed, dropping from 284 yards on average Thursday to 272 yards Friday. This left the average approach shot at 190 yards; the course definitely played long today despite no real effort to stretch out the tees. The wet conditions left the par 5 10th as a three shot hole for the entire field and lengthened the par 5 7th so much that eleven Tour players splashed their 2nd shot into the green. Approach shots played slightly easier, but the greens were destroyed by the end of the day. Short putts were bouncing like crazy near the hole; the early wave putted 0.5 strokes better than the the late wave because of how damaged the greens were in the afternoon. After an opening round 66, Rory jumped into the lead at the close of Friday with a second round 67. Rory again showed off his all-around game, though his driving was noticeably less impressive than on Thursday – only 8/14 fairways. What carried him was a hot putter. He started slowly, missing a thirteen foot birdie putt on #10 and a ten foot putt for par on #12, but rebounded immediately with a birdie on #13 and an eight foot par save on #14. His longest of the round was a 31 foot bomb for eagle on 18. In all, he gained +2.2 strokes from putting, 10th best in the field. Rory’s putting hasn’t been talked about nearly as much as his ridiculous driving or consistent iron play, but it’s played a huge role in his great season and recent surge to demi-god status this summer. In his previous few seasons on Tour he’s been a slightly below average putter, but this season he’s jumped to gaining +0.4 strokes on the field with the putter – good for top 20 on Tour. That doesn’t even include his victories in the European PGA at Wentworth or Open Championship where we don’t have strokes gained data, but where he surely putted well. In his six rounds at last week’s WGC-Bridgestone and this week’s Championship, he’s gaining +1.5 strokes per round on the field from putting. That’s way better than anyone can sustain (the very best approach +1 stroke gained). Sure he’s driving the ball at a heretofore unseen level and, yes, the rest of his game is great too, but the main reason he’s destroying everyone the last few weeks is because he’s making everything. At some point he’ll stop making everything – he may even regress back into an average putter (hot putting is the most fickle mistress in golf). The crazy thing is that he’s still probably the best player in golf even if he’s an average putter. The best part of the afternoon wave today was watching the show Jason Day was putting on tee to green. His front nine was a collection of bombed drives, darts to inside ten feet, and green after green hit (he missed his first on #10). His 240 yard iron to fifteen feet to set-up eagle on #7 was a ridiculously good shot, but I think his best hole was the 324 yard drive on #2, followed by a high approach to 17 feet, and a birdie. Not bad for a hole that played hardest on the course and where only a quarter of the field even hit the green. In all, his drives and approach shots gained +4.9 strokes on the field Friday, the best of either round. Day was great tee to green on Thursday as well (+4.3 strokes), but didn’t make anything on the greens. The putter heated up Friday and he surged into a tie for 2nd. In the post-round interview he still claimed his thumb wasn’t 100% so it’s kind of crazy to see him so sharp on these long shots. Same methods used as yesterday. Players who drove right actually played this hole 0.07 strokes better than those who played left a complete flip-flop from yesterday. The proportions choosing each side stayed the same, but because of the wet conditions I think some players just misjudged what length shot they’d be left with from the left fairway. There were eleven water balls from the left side today, compared to just four yesterday, and about half of those driving left ended up laying up to the right fairway because they didn’t have the length to challenge the green in two. 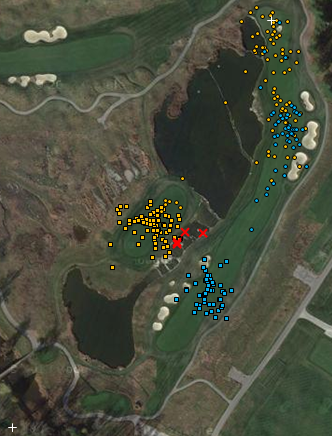 Same color scheme – left drives in gold, right in blue. Notice how muddled the lay-up zone is with the second shots of guys who drove it left. How Bad are the Club Professionals? The PGA Championship is unique among PGA Tour tournaments in that it qualifies the best twenty club professionals to participate. These guys rarely make the cut – Ryan Heliminen was top this year at T75 – and typically finish dozens of strokes off the lead. But just how bad are they? Are they uncompetitive off the tee, while solid putters? Using the two rounds of strokes gained stats I’ve gathered, it turns out that they’re pretty uniformly bad at everything. If you take the worst PGA Tour player in each of the major shot types – Kyle Stanley’s putting, Mike Weir’s driving, Robert Garrigus’s short game, etc. – you pretty much have the typical PGA club professional. None of this is meant to disparage them. During TNT’s feature on club pro Michael Block he stated that he only hit about one bucket of balls a week. PGA Tour players are playing half the weeks out of the year, and you have to practice constantly to maintain even the ability to be a bad PGA Tour player. That a club pro can show even near-PGA Tour-level talent without all that practice time is impressive. Six US players have already essentially qualified for the Ryder Cup squad, leaving three automatic spots to be decided at the conclusion of the PGA Championship and three more captain’s picks. I ran a simulation to determine who is in the best shape as of the end of round 2 to get one of those remaining three spots. Right now, Patrick Reed, Jason Dufner, and Zach Johnson are slightly in front of a group of players including Keegan Bradley, Phil Mickelson, Brendon Todd, and Ryan Moore. Keegan Bradley missed the cut, meaning he’s completely out of automatic qualification (though everyone suspects he’ll reprise his 2012 pairing with Phil Mickelson through a captain’s pick). Jason Dufner also has no way to earn additional points, as he withdrew with a neck injury. Patrick Reed made the cut and looks almost certain (95%) to earn automatic qualification to the team. Reed would have to be passed by three US players to drop off the team, which is obviously unlikely as only Mickelson, of the group right behind him in the points ranking, is projected to finish high. Zach Johnson also looks like a pretty sure bet to make the team (81%). Johnson sits in 9th currently, but should pass at least Dufner simply by completing the tournament. Phil’s big move today propelled him into great position to qualify (67%). In his easiest scenario to qualify, Phil needs to finish around 15th or better to pass Dufner. If no one else makes significant moves among Moore, Todd, or others further down, that should be enough to get him on the team. Of the longer shots, Dufner is still around 19% to maintain his spot. It’s completely up in the air whether he’ll be healthy enough to play, but the event is still almost two months away. Ryan Palmer (12%) can qualify with a very high finish – he’ll probably need at least a two way tie for 2nd to get on the team. Ryan Moore (12%) has an outside shot at qualification, though he’ll need to make a serious move and probably finish top ten. Steve Stricker (3%) needs to win to have any hope of getting in. A half-dozen others like Brian Harman, Billy Horschel, Bill Haas, and Brandt Snedeker could get in with wins or second place finishes. Ken Pomeroy’s numbers are below. Pinnacle Sports is dealing Rory +124 which is…something.